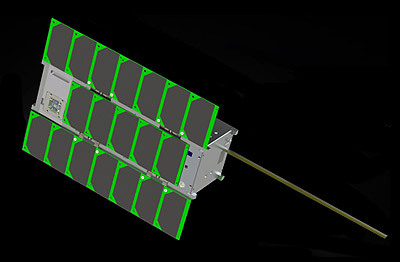 MinXSS (Miniature X-ray Solar Spectrometer) is a nanosatellite project of the Laboratory for Atmospheric and Space Physics (LASP) at the University of Colorado at Boulder to built a 3U-CubeSat to take observations of the Sun. MinXSS is a 4-year, ~US$1 million project to design, build, integrate, test, and operate the 30 cm × 10 cm × 10 cm satellite, that was launched into low-Earth orbit in December 2015 to measure the intensity of the soft X-ray spectrum from 0.4 keV (30 Å) to 30 keV (0.4 Å) with a resolution better than 0.15 keV full-width half-max. This region is of particular interest for observations of solar flares and active regions. The MinXSS project heavily involves its graduate student team members with scientists and engineers at the University of Colorado, Boulder and the Laboratory for Atmospheric and Space Physics (LASP). MinXSS replaces the original HiLITE (High Latitude Ionospheric Thermospheric Experiment) proposal, which was selected by NASA for the ELaNa program. MinXSS will be launched via ELaNa towards the ISS, from where it will be deployed. It was selected in 2014 by NASA as part of the Science Mission Directorate's Cubesat Initiative. MinXSS was launched in December 2015 onboard of Cygnus CRS-4 to the ISS, were it was deployed into orbit on 16 May 2016. It operated until reentry on 6 may 2017. The second flight model was launched on Spaceflight Industry's SSO-A multi-satellite launch on a Falcon-9 v1.2 (Block 5) rocket.